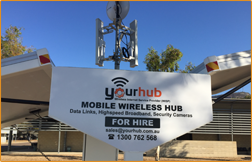 Yourhub.com.au - Mobile SmartHubs, Radid deployable dats, broadband and security surveillance hubs. Yourhub Mobile SmartHubs - Deployable SmartHubs. Rapid Deployable SmartHubs: Data, Internet & Security Surveillance Hubs? 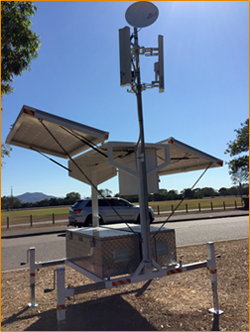 Yourhub has developed a fully self sufficient deployable system that can provide Point to Point Data Links, Broadband Internet & Security Surveillance all in the one hub. Our Mobile SmartHubs can be configured for Point to Point data links, High Speed broadband via Yourhub's Satellite Towers or by utilising the 3G or 4G mobile network. Case Study: In July - August 2015 the American Army deployed over 300 soldiers to an Australia Army Base for a period of 1 month. During this time the US soldiers were able to communicate with family and friends via our Mobile SmartHub with Yourhub's High Speed Broadband and with no long term contracts. Our Mobile SmartHubs can be configured with a combination of multiple High Resolution Cameras with Infrared (IR) and Pan Tilt Zoom (PTZ) capabilities for site surveillance and security. All recordings are stored off site for security reasons and can be viewed via our smart phone app over live or recorded stream. Our Mobile SmartHubs can be configured prior to deployment for Security surveillance, Data, Internet and Voice at the same time offering a complete solution through either one or multiple Hubs. For more information on short term or long term Hire, Lease or Purchase of a Mobile SmartHub please contact us. For more information, or no obligation free quote please call us on 1300 762 568.